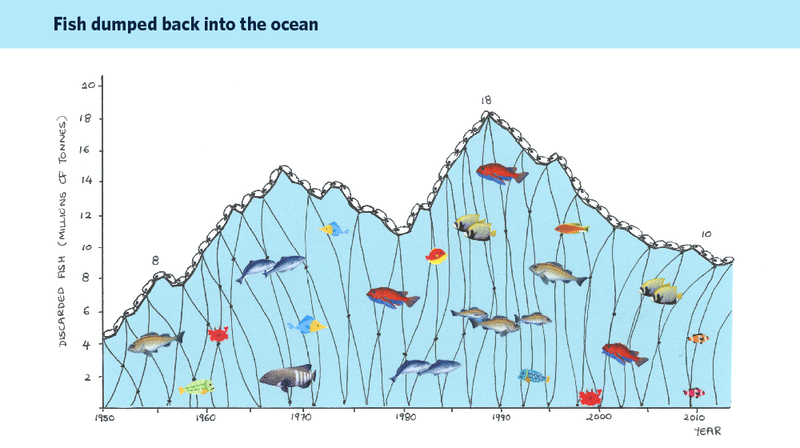 A paper published last week titled, Global marine fisheries discards: A synthesis of reconstructed data, concludes that commercial fishermen have thrown away (discarded) about 10% of catch over the past decade. Researchers, led by Dirk Zeller, used catch reconstructions – estimates of how many fish were caught – to approximate that around 10 million tons of fish are discarded at sea per year. This number is down from a high of 18 million tons in the 1990s. Zeller et al. 2017 suggest that the decline in discards are a result of declining fish stocks, though they acknowledge that gear and management improvements could also play a role. Indeed, worldwide fish stocks have remained relatively stable since 1990s, indicating that perhaps management and gear technology have played a larger role in reducing discards than researchers propose. Here are some pictures and a description of fishery discards, courtesy of Lisa Borges, who also contributed to this post below. This is a box of discarded catch (around 40 kg) from an irish demersal otter trawler targeting whitefish operating in ICES area 6a, west of scotland back in 2002. a very typical box of discards, showing small size species of their target species (cod haddock and whiting), plus some low commercial species such as gunards, and dogfish (spotted shark in the picture Scyliorhinus). No protected species (at that time). This was a trip sampled by an observer and the sampling scheme was designed to sample a box of discards per haul as many hauls as possible. Previously, we have featured an in-depth analysis of discard policy in the EU by Philip Taylor & Griffin Carpenter. In the below comments we offer 3 different perspectives on fishing discards and the recent Zeller et al. 2017 paper. The recent paper by Zeller et al highlights challenges associated with estimation of discards and interpretation of overall estimates and trends. Their work builds on an extensive body of research, most notably earlier global discard estimates published in 1994 and 2005, and relies heavily on the Sea Around Us database and catch and discard estimation methods outlined by the authors. Unwanted fish results from almost all fishing . Fishers generally target a species or group of but fishing gear is not perfectly selective for species or size. Regulations may preclude landing of some species and sizes (usually smaller fish), or economic factors may favor retention of larger fish or higher-value species If the undesired fish are not retained and marketed in some form (e.g. as fish meal for aquaculture feed, or fertilizer) they are generally returned to the sea as discards. This issue is not unique to fishing, waste is a concern in all types of food production. In the United States, roughly 7% of all crops are wasted at the farm (i.e. never harvested), with estimates up to 40% of food waste through the supply chain. In recent years, waste associated with fisheries discard has become a major public policy issue in some regions, with partial discard bans being implemented in Norway, the European Union, and elsewhere. At the same time, regulatory and operational innovations have resulted in lower discard rates in some fisheries, and demonstrated the potential for broader improvement. Fisheries discard can be reduced by development and use more selective fishing methods, developing markets for unfamiliar species or products, and by regulatory approaches which provide incentives for improved selectivity and/or utilization or even prohibit certain types of discarding. Zeller et. al. argue that high-grading (discarding of lower-value in favor of higher-value fish) and regulatory discard are major problems and shortfalls of individual transferable quota (ITQ) fisheries. While high-grading and regulatory discarding are substantive causes of discarding, ITQ-type of programs (catch share, rights-based) may include provisions for transferring of quota among participants as well as sharing information that can improve selectivity. These types of programs also reduce or eliminate the race for fish and thereby reduce levels of unwanted fish. They can also encourage accountability, a key to improved catch and discard data. Examples can be found in Alaska and elsewhere. Zeller at al.’s overall global discard estimate for 2014 is not inconsistent with data that is reported elsewhere (less than 10 million t/yr, with a downward trend), but generalizations in their discussion are overly broad and fail to recognize improvements happening around the globe. For example, they assert that most discards were generated by industrial (i.e. large-scale) fisheries, but fail to highlight the fact that discard levels in some industrial fisheries (e.g. NE Pacific) are remarkably low. These improvements, especially those related to governance and fishing technology, set examples which can be adapted for use elsewhere and will undoubtedly result in reductions in discard in some regions which are currently lagging. We should view the results found in this paper, as a glass that is half-full rather than half-empty. Major challenges associated with poorly-regulated fisheries remain, and inadequate data and enforcement require serious attention. However, creating incentives to reduce discard through regulatory measures, and investing in improving selectivity and utilization, have been shown to reduce waste and discard in many instances and we can expect this type of innovation to increase. The Zeller et al. (2017) paper titled Global marine fisheries discards: A synthesis of reconstructed data highlights the more recent discarding and waste of the fish specie “pollock” (Theragra chalcogramma) also known as (Gadus chalcogrammus) under poor management regimes in the Northwest Pacific Ocean (FAO Area 61). In Figure 5 of the paper, the estimated discards of “pollock” in FAO Area 61 are as high as 3 million metric tons during the 1990’s and in more recent years still in excess of 1 million metric tons. The geographical distinction is important for a host of reasons, including differentiating between the rigorous catch monitoring and accounting requirements in effect for the Alaska pollock fishery versus inadequate monitoring and accounting of catches in the Russian pollock fishery. In Area 67, where genuine Alaska pollock fisheries operate under Fishery Management Plans (FMPs) with Increased Retention/Increased Utilization (IR/IU) regulations, certain species, including pollock, must be retained except for very limited exceptions. National Marine Fisheries Service (NMFS) fishery observers stationed aboard all Alaska groundfish harvesting vessels, including two observers on at-sea processing vessels and at all onshore processing plants, monitor for compliance with IR/IU regulations and record haul level estimates of discards by taxa. According to data that is publicly available, within the genuine Alaska pollock directed fishery, pollock discards account for less than 0.05% of the total catch. The Zeller et al. paper uses the Sea Around Us project database to estimate the most recent discards (2014) of Area 61 Russian caught pollock at 1,143,767 tons. In contrast, within the Alaskan waters of Area 67, total pollock discards were less than 15,000 tons in 2014, with the majority of discarding accounted for by regulatory discards in the directed flatfish fisheries. Seafood consumers are becoming increasingly aware of sustainability, and they deserve to know the provenance of the seafood they are purchasing. Governments, industry and academics all need to be precise about nomenclature, including using geographical indicators. The term “Alaska pollock” should only be applied to pollock harvested in U.S. waters off Alaska. Austin Estabrooks is a Natural Resource Analyst for the At-sea Processors Association, he works on sustainability initiatives and cooperative management for the US-flagged catcher processor fleet that primarily targets pollock in the Bering Sea and Aleutian Islands. Discarding part of the catch at sea is a well-known practice in most fisheries worldwide, but in the past, has been unregulated in most fishery jurisdictions. Through successful public opinion campaigns that see discarding as a waste of resources, the issue of fisheries discards is one that is now widely known. Public pressure is pushing fisheries management to limit discarding, and a prominent example of is the European Union (EU) 2013 Common Fisheries Policy (CFP) landing obligation. The objectives of discard bans are usually (i) to contribute to the sustainability of fisheries through the improved implementation of catch limits and (ii) to reduce unwanted catch. The latter objective recognizes that not all catch can be utilized (due to stock sustainability, markets, societal values, etc.) and should therefore not be caught in the first place. Discard bans, if accompanied by high levels of at-sea monitoring and effective control, will therefore increase fishery selectivity instead of increasing utilization of unused catch. This is because the use of discarded catch requires changes in markets that will take time to occur, many stocks still need to recover, while full catch retention policies, such as the EU landing obligation, partially limits their effective use (for non-human consumption). On the other hand, discards estimations are crucial for assessing the full impact of fisheries upon fish populations and upon the ecosystem in which they operate. In this context, the Zeller et al paper provides a welcoming updated overview of global discards. However, the authors suggest a connection between full catch retention policies with an objective to limit trawling. While it is true that high discarding is associated to trawling, the adoptions of discard ban polices are foremost related to stocks sustainability issues and not gear specific. Secondly, and understandably, the analysis is limited to the parse taxonomic data available, mostly restricted to commercial species discards. However, as pointed out, discards reflect the species diversity of the ecosystem where the fisheries operate, and associated to that the majority of discard are due to no or low commercial value species. Therefore the species analysis should be taken with care as it does not reflect the whole reality. But this said, what does? In the European Union Europe after three years of the landing obligation it seems that fishing operations have not changed significantly. In most fisheries unwanted catch was simply reduced by what I call fake unwanted catch reduction mechanisms: reductions of minimum landings sizes, TACs suppression or adjustments, inclusion in protected species status. The landing obligation has, however, clearly diminished our knowledge of discarding behaviour and quantities, as observer’s programmes have been severely hampered by refusal dates and fishers are no longer forthcoming on their discarding behaviour. Perhaps here we are after all in dire need of the estimation procedures developed by Zeller et al. Lisa Borges’ career in discards began when she managed the data from the discard observers program at the Marine Institute in Ireland, where she also did a PhD in demersal fisheries discards. She continued this work in IMARES, the Dutch Fisheries Institute, where she worked on discards from pelagic fisheries. In 2007, she moved to the European Commission to work on conservation policy for fish stocks in Atlantic waters, responsible among other things for defining new policies on discards in European fisheries. In 2010, she created her own consultancy company, FishFix. It shows that increased utilization is economically feasible in many instances. The biggest challenge is when catch is transhipped in remote locations with small populations, far from potential markets, and with limited value-added processing capacity. Some of the pilot projects in the study are now fully operational, with reductions in discards and new business for the crew involved. Congratulations Lisa and ali. How good it is to have someone pointing out such studies and making a three hands digest of them! Keep on doing it and I promise I will follow you!